The Lamp block displays a color indicating the value of the input signal. You can use the Lamp block with other Dashboard blocks to build an interactive dashboard of controls and indicators for your model. You can specify pairs of input values and colors to provide the information you want during simulation. Dashboard blocks do not use ports to connect to signals. To connect Dashboard blocks to signals in your model, use connect mode. Connect mode facilitates the process of connecting Dashboard blocks in your model, especially when you want to connect multiple blocks at once. If you only want to connect a single Dashboard block, you can also use the Connection table in the block dialog box to make the connection. To enter connect mode, click the Connect button that appears above your unconnected Dashboard block when you pause on it. In connect mode, when you select one or more signals or blocks, a list of parameters and signals available for connection appears. Select a signal or parameter from the list to connect the selected Dashboard block. To connect another Dashboard block, pause on the block and click the Connect button above it. Then, make a selection of signals and blocks in your model, and choose a signal or parameter to connect. When you finish connecting the Dashboard blocks in your model, click the Exit button in the upper-right of the canvas to exit connect mode. Dashboard blocks can only connect to real scalar signals. You cannot use the Connection table to connect a Dashboard block to a block that is commented out. When you connect a Dashboard block to a commented block using connect mode, the Dashboard block does not display the connected value until the you uncomment the block. Dashboard blocks cannot connect to signals inside referenced models. If you turn off logging for a signal connected to a Dashboard block, the model stops sending data from that signal to the block. To view the signal again, reconnect the signal. Select the signal to connect using the Connection table. Populate the Connection table by selecting signals of interest in your model. Select the radio button next to the signal you want to display. Click Apply to connect the signal. States match a display color to the value of the connected variable or parameter. Each state consists of a State and a Color. State — Connected variable or parameter value that causes the Lamp block to display the specified color indication. Color — Lamp color when the connected variable or parameter value matches the corresponding State value. You can select from a palette of standard colors or specify a custom color with RGB values. The [undefined] state specifies the color of the Lamp block when the input value does not match any of the values specified in the States table. Click the + button to add another state. Value — Scalar double value corresponding to the state. Color — 1-by-3 [r g b] vector specifying the color for the Lamp to display. The ColorDefault parameter specifies the color for the Lamp block when the value of the connected signal does not match any of the specified state values. Specify the ColorDefault parameter as a 1-by-3 [r g b] vector with values between 0 and 255. Position of the block label. When the block is connected to an element in the model, the label is the name of the connected element. 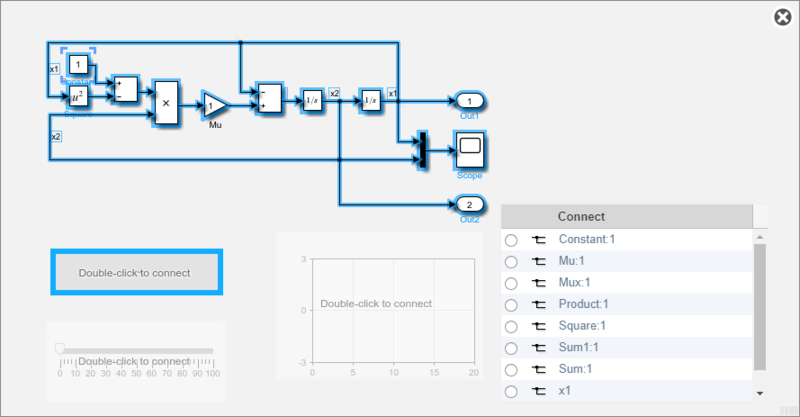 Combine Stateflow® with Simulink® to efficiently model hybrid systems. 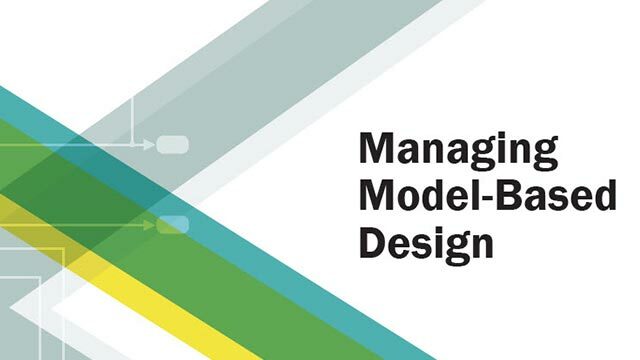 This type of modeling is particularly useful for systems that have numerous possible operational modes based on discrete events. 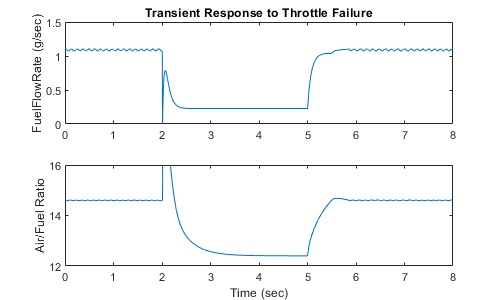 Traditional signal flow is handled in Simulink while changes in control configuration are implemented in Stateflow. The model described below represents a fuel control system for a gasoline engine. The system is highly robust in that individual sensor failures are detected and the control system is dynamically reconfigured for uninterrupted operation.